You must make reservations at least 5 minutes in advance of the time at Sarajevo Restaurant & Lounge. Fridays: Latin Night 2 Rooms 4 Dj's playing hottest Latin hits. Saturdays: International Saturday's 2 Rooms 4 Dj's playing music from all around the world. Sarajevo pays homage to the tastes and aromas of the Mediterranean - featuring the influences found in Balkan, Greek, Turkish & Euro cooking. fresh local ingredients. Fresh Seafood from the Pacific waters, Meats from the mid-west, Produce & Fruits from Washington State. Sidewalk Patio with Puget Sound Views, Private Suite with Bar for 100 Guests. Cold cuts of smoked beef, cured sausage, balkan feta, olives, cherry tomatoes, peppers, cornichons, potatoes, bread. Balkan feta, red pepper, onion, balsamic, catching fire with ouzo. Served with house made aioli. Grilled tenderloin, roasted pepper coulis. Garbanzo, hummus, tzatziki, harissa & lepinja bread. Cabernet poached figs, triple cream brie & pita. 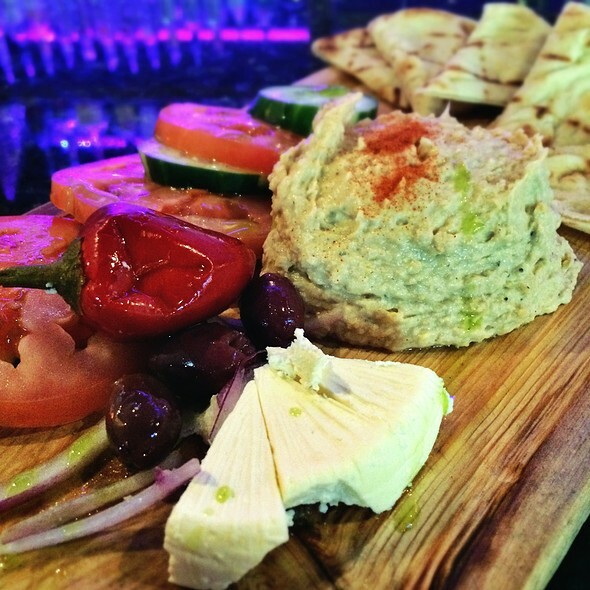 Carrots, cucumber, pepperoncini, feta, olives, pita. Grass fed beef, ajvar, smoked Gouda, fries. Balkan feta, pimenton de la vera, lemon juice. Red chili peppers, minced garlic, Zilavka wine, lepinja bread. 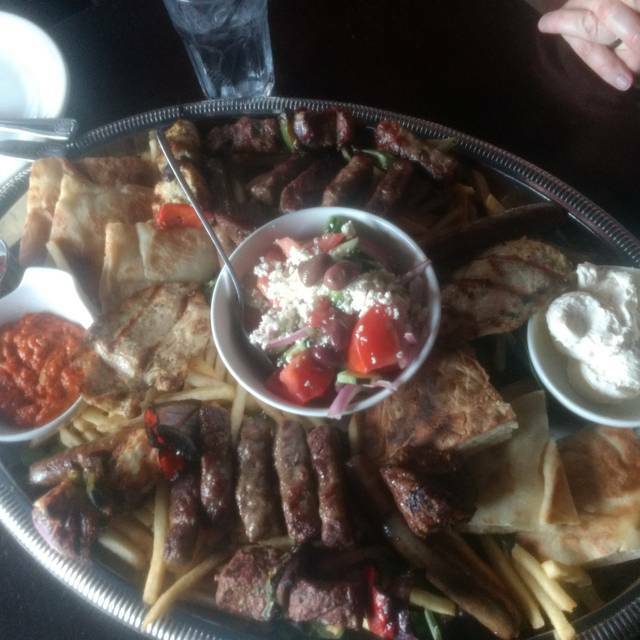 Beef gyros, rolled in pita bread, onions, parsnips, tomatoes, feta, tahini, tzatziki, fries. Harrissa spiked Yukon potatoes with house made aioli. Served with basmati rice, hummus, tzatziki, harissa & lepinja bread. Marinated chicken breast, olive oil, herbs & house spices. Beef tenderloin, herbs, smoked paprika. Tender lamb medallions, house spices, garlic. Fresh tiger shrimp, garlic, parsley, olive oil. Add Chicken $4, Salmon $6, Prawns $6. Ask server for today's house made. Slow cooked salmon, vegetables, served with lepinja bread. Half salad, cup soup of your choice. Summer greens, parmesan cheese, blueberries, strawberries with red wine vinaigrette. Cherry tomatoes, freshmozzarella ciliegine, basil, olive oil & balsamic. Grilled romaine, Caesar-ajvar vinaigrette, reggiano cheese, cherry tomatoes & lepinja croutons. 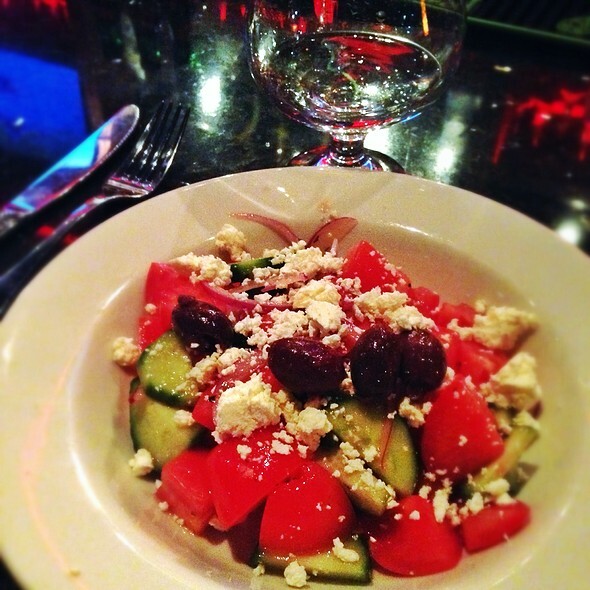 Tomatoes, cucumbers, onions, kalamata, olives, feta cheese, olive oil & red wine vinaigrette. Grilled tenderloin, summer greens, cherry tomatoes, cucumbers, fried onions, blue cheese dressing. Mixed greens tossed with feta cheese, olives, cucumber, tomatoes, red bell peppers, onions, Italian dressing. Roasted peppers, caramelized onions, harissa, feta, served with our house salad or french fries. Snake river farm, gouda, ajvar, roasted pepper, onions, lettuce, tomatoes, served with our house salad or french fries. Marinated chicken breast, fresh mozzarella, basil, tomatoes, balsamic, lepinja, served with our house salad or french fries. Cevapi refers to lamb/beef sausages used in the dish, accompanied by homemade lepinja bread, chopped onions, ajvar, kajmak. Pita bread, romaine, cucumbers, onions, turnips, tzatziki, feta, harissa, tahini. Hummus, romaine, cucumbers, tzatziki, feta, tomato, onion, turnips, harissa, tahini. Fresh pasta, olive oil, garlic, cauliflower, mushrooms, tomatoes, red peppers, basil & feta. Grilled steak, pepper jack & cheddar cheese, tomatoes, grilled onions, harissa, Sarajevo potatoes, cilantro, fresh romaine, served with our house salad or french fries. Please ask about our "Cocktail of the Evening"
This is a night club that tries to be a restaurant by day. The food was ok. The device seemed fine. Just a limited menu in a strange atmosphere especially the bathroom. Great prices for the large food portions. We are from out of town and went on a Saturday night. Stayed for the club after dinner and the music and ambience was amazing. Dj played all the hits. Our server during dinner was awesome. All the servers and bartenders were friendly and attentive. We all agreed we would definitely go back again. Great food - attentive service - large portions - great value. Two thumbs way up. Better than anyone anticipated! 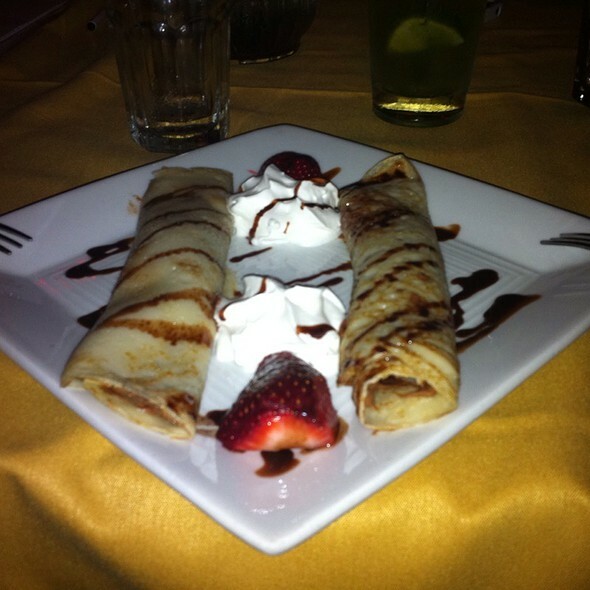 Great food yummy desserts you should try crepes and baklava. Went for birthday and Latin dancing. Initially the place was empty and service just so so. After dinner the service and ambiance improved. Latin dance music in two rooms. Great dancing. Sadly, I was disappointed in the experience. We arrived early & were seated immediately- the restaurant was empty. Our server was delightful, a real asset to the restaurant. However, the bar tender - who acted as if he owned the place - ruined the dinner for us. He was loud & bossy, arguing with the only 3 customers at the bar. When I asked if we could hear some Bosnian music (since we were in a Bosnian restaurant) he said no, lied that the owner wanted the current music. The owner wasn’t even there but we were subjected to strange elevator music anyway. We quickly finished our food & left. amazing food and great service!! 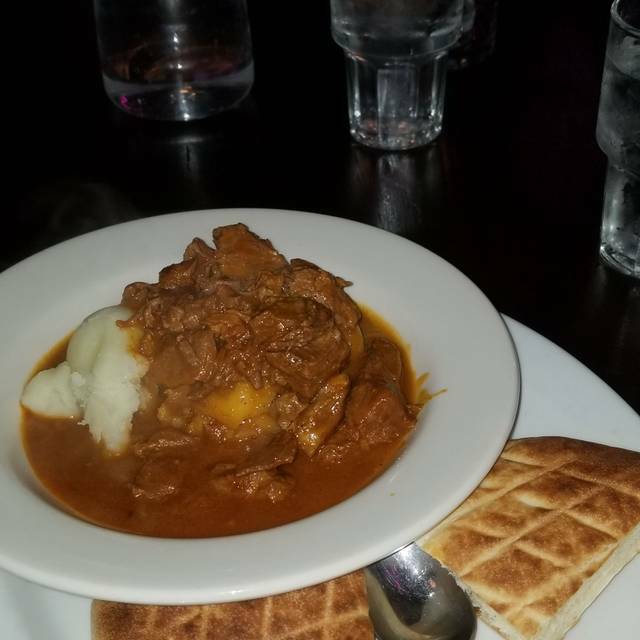 the goulash was delicious and the bread to die for. the server was super friendly and knowledgeable. Enjoyed a wonderful meal here. It was a beautiful evening so we sat outside. Service was excellent! We decided to sample a number of shared items - flaming cheese and gyros sliders were really, really good! Fries that accompanied them were also great. Wish we lived closer - we'd be regulars! Food was delicious and service was great! Space is dated but outdoor seating looked nice. Our server was attentive but rather rushed even though place was practically empty. Wine list was non-existent so we ordered martinis which were decent. Happy hour food was better than I expected with good portions and flavors. However, with so many options in Belltown, I would not go back. Had an amazing time! Great food, drinks, and service. 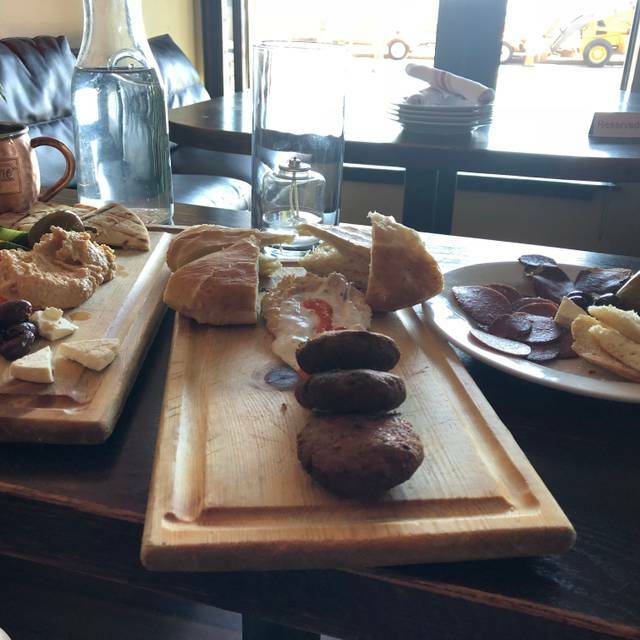 Interesting menu combining traditional dishes of the Balkan region and contemporary US additions. Well prepared, nice use of spices and herb, fabulous bread, attentive service. Great spot for people watching. The food is good and the server was so friendly! Try the brie with fig. Yummy! Service friendly but very slow, especially given there were few customers. Lamb kebab had no flavor, and looked microwaved instead of grilled. Red house wine terrible. Chopped salad no flavor either: so so tomatoes, very little feta, and no hot pepper. All of this very disappointing for someone who has visited the real Sarajevo and knows how great Bosnian cuisine can be, even in the cheapest most basic little restaurants. Interior most uncharming. Food was exquisite and the service was impeccable. This was an excellent double date night location. We arrived around 8pm, We had a meat platter! It was huge!!! Then the restaurant turned into a night club and we danced! The staff was friendly and accommodating. I will be back. We enjoyed the happy hour with $5 well drinks and beer. They offered a nice selection of small plates, also at a discount. It was a great place for a pre-symphony dinner at a very reasonable price! It was very fun and tasty. Latin music in the background, and good food served till late. If you go try the Cajun prawns. This was a delayed Valentine's meal for my wife and I. She has connections in Bosnia, so it seemed like a happy convergence of Seattle with her interests. The woman who waited on our table was from Montenegro, and very good at her job - we were well looked-after throughout our meal. She was knowledgeable about the menu and offered good advice. My wife had a great mezze platter (I tested it thoroughly) and a succulent chicken kebab. I enjoyed a delicious calamari started, although my salmon was rather dry, although tasty. I'd probably say it's my fault for foolishly straying from Balkan choices! Anyway, there was no sign of the internet-promise of live music or dancing while we were there (early-ish on Sunday evening) so maybe we should have delayed our meal until a more party hour. But in compensation the restaurant seemed quiet (not empty), comfortable and satisfyingly romantic. Love this place, it feels like home away from home ;-) Superb service and great food, thank you Maja, Dino & the crew. Sarajevo is a good restaurant - not the best in Seattle but suitable for a meal. The food was good, not great, but still enjoyable. I can see this restaurant as being more attractive if more people were there. Everything was excellent. The tvs took away from the atmosphere but overall things were great. Authentic and Delicious. Next time I'm in Seattle I will dine here again. Best calamari we have ever tasted. Flambing cheese was excellent. Lamb kebabs were disappointing. Fourth visit for us and always enjoy it. Terrific food and service. We hear that it really gets jumping after 11pm but we always go for dinner. Amazing service, awesome food. The waiter was very friendly and treated us well. The food came out on time. I would recommend this place. Best cevapi I have had in years. Need more customers. We were the only table in there being served. What an awesome experience!! Highly, highly recommend this restaurant and bar! Delicious cuisine, great service and very enjoyable. We dined for my birthday and would definitely return. Great prices. 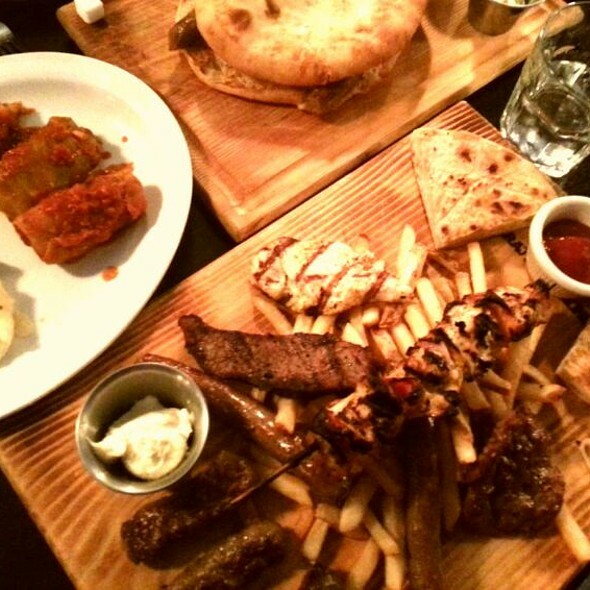 We had the lamb kabobs and the cevapi and bread with the crepes for dessert. Yum!!!!! Service was wonderful!!! First our waitress was really nice this was surprising as they seem understaffed and she was the only one taking care of 5 tables. The appetizers and entree were good though the entree was not a lot of food for the price (medium plate of pasta for $14). Friend got the salad, lettuce was essentially burnt. If you want cheap drinks and good service then this is for you! If your vegan or vegetarian, don't really recommend.